When you’re at death’s door, life’s not expected to be much fun, even – or especially – when it’s the door to Room 9, the one with the smiley. But then you don’t know Connor. He’s fifteen and he’s got terminal cancer. Well, we’re all terminal, because as Connor keeps saying, ‘nadie deja este mundo vivo’ which means no one leaves this world alive. Which is very true. I don’t like ‘cancer books’ and I hate bullies and irresponsible behaviour. 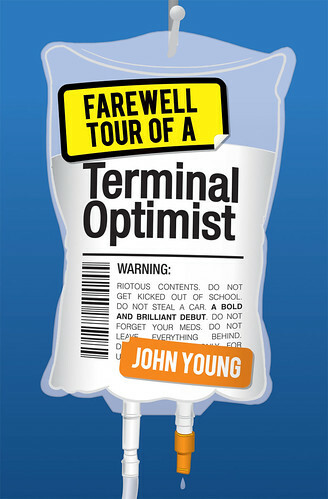 But while Farewell Tour of a Terminal Optimist has all this, it also has a lot of charm and fun and happiness to offer the reader. And before anyone says ‘well that’s easy for the author to write,’ the very sad fact is that John Young wrote the book as his own child was dying. I can’t even begin to understand where he got his strength from. At the beginning, Connor is getting another kicking from his bully Skeates. Well, he did put a dead bird in his dinner. So Connor might be small and weak, but he’s not one for hiding. He’s got one friend, a girl called Emma, or Emo. But when things turn really weird, it is Skeates he ends up running away with – although not in a romantic way. Connor’s father is in jail, his mum temporarily ill, and his sister died years ago. And he has cancer. Skeates decides they should try and visit Connor’s dad in jail, so they embark on a truly crazy, but also inspirational, trip across the Scottish Highlands towards Glasgow. Unfortunately Connor escapes Stornoway without his medicines, and he’s not sure he can trust Skeates. It’s a good thing he’s feeling adventurous and positive towards most of the often illegal suggestions Skeates makes. At least the adult reader sits there knowing this will not, cannot, end well. But what kind of not well will it be? How soon might Connor die? Or will Skeates or the Glaswegian football supporters kill him before the cancer does? Or maybe the skiing in Aviemore, wearing unsuitable clothes? The joyriding? And then, there really is no avoiding death’s door. This is sweet (yes really, Skeates), incredibly funny, and tremendously exciting. And there is a smiley on the door to Room 9. As Connor waits, he thinks ahead to what sandwich fillings his mum might choose for the funeral. This entry was posted in Authors, Books, Humour, Reading, Review and tagged John Young. Bookmark the permalink.